1. Place a wok or large, deep frying pan over a high heat. Add the groundnut oil and heat through for a few seconds, then add the salad onions and ginger matchsticks, stir-frying for 1 minute. 2. 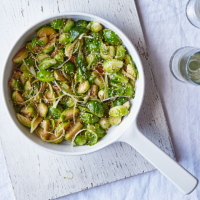 Throw the brussels sprouts into the pan and stir-fry briskly for 3 minutes, until almost tender. Add the sesame seeds and cook for 1 minute. Season with the soya sauce and a little salt. Remove the pan from the heat. Drizzle with the sesame oil and serve straight away as a side dish or with rice or noodles as a main course.